Want some cookies for breakfast? 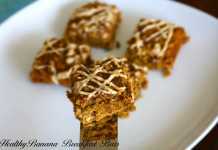 I’m back with another healthy breakfast recipe from The Sneaky Chef. Kids love cookies and won’t they be thrilled if we serve it for breakfast? 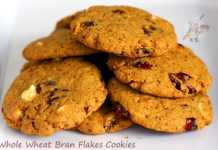 Then bake these breakfast cookies, made with fiber one cereal, a brilliant flour blend, dried cranberries and walnuts. Sometimes healthy stuff is not tasty, like whole wheat bread, bagel or pita for example. Even though these cookies are made of whole wheat pastry flour and wheat germ, they tasted very good to my surprise. I was skeptical about using wheat flour because I have baked with it earlier and sometimes the baked goodies does not smell/taste right. This is the first time I have had success using whole wheat pastry flour. I did not get the raw smell of wheat. I did not miss white flour at all in the cookies. You can take my word on that. The cereal gave a nice crunch to the otherwise chewy cookies. I would suggest adding dried cranberries and walnuts (this was not mentioned in the original recipe) because it enhances the taste, gives a very good texture to the cookies, also it has nutritional benefits. We adults can also munch on these healthy cookies without any guilt. My son ate the first cookie so fast, telling me that it was very nice, etc, but then as usual he stopped liking it from the next day. Try your luck with your kids! But touch wood, the blueberry milk, strawberry milk and cherry chocolate milk are still his favorites. 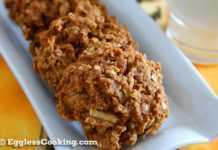 The healthy breakfast cookies made with fiber one cereal, whole wheat pastry flour and wheat germ tastes awesome. In this recipe, applesauce used as an egg substitute. Combine the flours and wheat germ in a bowl. Store it in an air-tight container or sealed bags and use it for baking anything from cakes, cookies, brownies etc. Preheat oven at 400F/200C for 15 minutes and line/grease a baking sheet. Coarsely crush the cereal either using a rolling pin or pulse it a couple of times in the food processor. In a large mixing bowl, whisk together the flour combo, crushed cereal, baking soda, salt and cinnamon. In another bowl, whisk together applesauce, brown sugar, oil, vanilla and ricotta cheese. Add the dry ingredients to the wet mixture and combine gently. Drop by tablespoonful onto the baking sheets, leaving about an inch between cookies. Flatten cookies with the back of a fork and sprinkle tops with sugar. Bake about 18 to 20 minutes, or until nicely browned and crispy around the edges. Leave it in the baking sheet for 5 minutes and then transfer to a wire cooling rack to cool it completely. Serve it with blueberry milk or strawberry milk. For crushing the cereal: Put the cereal in a ziploc bag, seal it and then use a rolling pin to crush it. The cookies baked in the aluminum pan were done in 18 minutes. But the batch baked in a dark colored pan became very brown around 17 minutes itself. So keep an eye. I think reducing the oven temperature to 375F/190C should be fine if using a dark colored pan. I think the only mistake I did was not storing the cookies in the refrigerator. The cookies had a nice crunch on the day I baked. Like always I stored them in a cookie jar, because nothing was mentioned about the storage. In the following days it became more chewy and soft. I guess storing them in the fridge, once the cookies cool would retain it’s freshness. 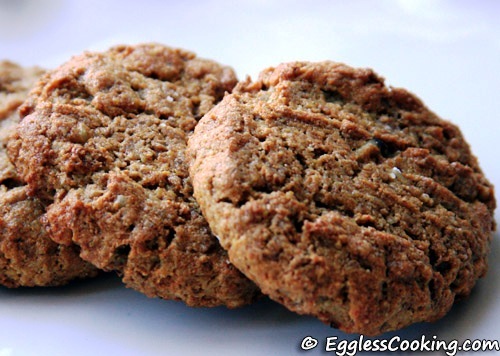 These breakfast cookies go to Egg Replacement Event – Pureed Fruit hosted by me. Previous RecipeCare For Some Homemade Strawberry Milk? Next RecipePepporanata – Cooking this is easier than pronouncing it! Can fat free ricotta be used? Also, do you have estimated nutrition facts? Can’t wait to try these. They sound great! Thank you! Yes you can use fat free ricotta too. I will update the nutrition information within a day or two. Please come back to check it. Hmm…can’t think of anything other than tofu or cottage cheese. But not sure how it will turn out. I am wondering why you use 3 cups to mix the flour mixture, and only use 3/4 cup in the recipe. What do you do with the remaining 2 1/4 cups of flour mixture once you have finished the recipe? You can use the flour in other baking recipes instead of all-purpose flour. Unsweetened applesauce. I have mentioned it in the list of ingredients itself. They look amazing, and they’re healthy. You’re amazing, Madhuram. crispy cookies and kids will sure love to have this and me tooo…. something spl and new waiting in my blog for u. come and pick up dear…. The cookies look gorgeous…I’m making these for my mom over the holidays..she doesn’t eat eggs. Going to add some dried cranberries too! Wow, what a healthy way to eat breakfast! The cookies look so mouth-watering Madhu! Just to keep myself positive and upbeat, I think that if not for the kids we would have never tried all these things. The cookies look just delicious. I will try to keep an eye on “Fiber One cereal Honey Clusters” never seen that before. RC, we also wouldn’t gain weight eating all the leftovers 🙁 You should try the cereal, for 1 cup serving it has 13 gms of fiber and tastes good too. There is the All Bran variety also, which has 14gms fiber for 1/2 cup, but we still are not ready for that becuase it tastes like mulch. Try this smoothie using Honey clusters cereal. These look great. I love cookies which are actually good for you. Never tried a ricotta cheese cookie. Cookies look great. My daughter would love to have them for breakfast. She likes very few fruits and this recipe is a better way to have them. Thanks Madhuram for leaving your feedback for the Kootu. I’m going to send A there because he eats only oats ganji (with majjiga) without complain. You can give him 3 times a day and he will happily gulp it without complaining. My culinary efforts are real waste here. Welcome back , the cookies look beautiful and delicioius.